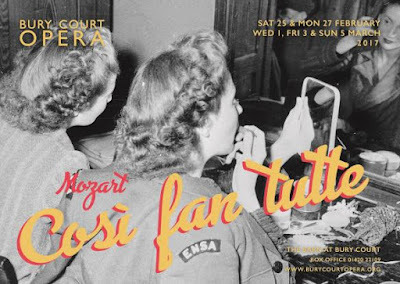 Bury Court Opera's Spring season starts on Saturday 25 February 2017 (and runs until 12 March), with Daisy Evans production of Mozart's Cosi fan tutte and the season continues with a double bill of the anonymous 18th century opera L'Ospedale (in the production by Solomon's Knot) and a brand new opera, Mad King Suibhne by Noah Mosley. Daisy Evans' new production of Cosi fan tutte features Gemma Summerfield, Bethan Langford, Alexander Otterburn and David Shaw as the lovers, with Nina Lejderman and Eddie Wade. Paul Wingfield conducts Camerata Alma Viva. L'Ospedale is an anonymous 18th century setting which Solomon's Knot revived in 2015 (see Ruth's review on this blog), and James Hurley's production will feature Rebecca Moon, Michal Czerniawski, Thomas Herford, Victor Sicard, Lucy Page and Jonathan Sells, with James Halliday conducting. Noah Mosley's new opera Mad King Suibhne is directed by Ella Marchment, with a cast including Dominic Bowe, Edward Hughes, Henry Grant Kerswell, Laura Woods, Isolde Roxby and Raphaela Papadakis. Full details from the Bury Court Opera website.